Many of the scientific breakthroughs of the twentieth century were first reported in the journal Nature. A Century of Nature brings together in one volume Nature’s greatest hits—reproductions of seminal contributions that changed science and the world, accompanied by essays written by leading scientists (including four Nobel laureates) that provide historical context for each article, explain its insights in graceful, accessible prose, and celebrate the serendipity of discovery and the rewards of searching for needles in haystacks. 15. Molecular switches for "animal electricity"
"Nature’s eminence attracts papers of revolutionary import, making this volume of 21 articles of wide interest. A preface to each article explains its recognition . . . not only as a milestone in its field but also as meaningful for ordinary people. . . . This anthology’s aura of discovery will absorb avid science fans." "Some of the original papers almost leap off the page. . . . In other cases it is the accompanying essays, many written by those working close to the original research, that bring the papers to life. But whatever the topic--plate tectonics, extrasolar planets, T-cell immunology, the ozone hole, the generation of animal body plans, cloning--the essays also entice the reader into far greater appreciation of the work than can be obtained when it is transmitted through textbooks." 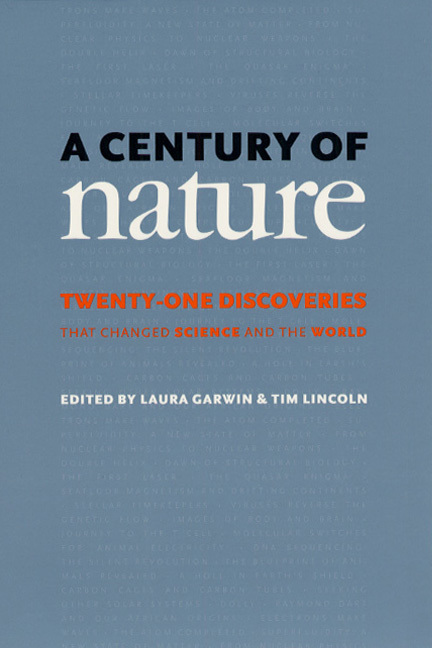 "Laura Garwin and Tim Lincoln give us a handsome little book, a celebration of 21 of the most explosive and influential papers published by <I>Nature<I> in the 20th century. Beginning with the unearthing of the African origins of humanity in 1925 and ending with the identification in 1995 of the first extrasolar planets that may harbor life . . . <I>A Century of Nature<I> is a pleasure to read."